These days, Shia Muslims. are residing in almost all parts of the world and converse in many languages, some of us were even born in foreign countries and have never visited our homeland, so we have gradually lost a grip on our first language. Our religious and social values have been at variance, one way or another, as per our exposure and interactions with different cultural, social and religious factors. Our ancestors having gone through the hardship and cruel treatment from Bani Umayyahl.a. and Bani Abbasl.a. as well as other similar Muslim rulers who forced them to migrate from city to city and country to country, initially, to escape persecution and brutal punishments- for the only crime of loving and following Ahl Al-Baytasws. 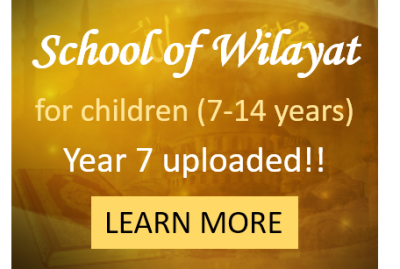 However, under all circumstances, they had adhered to the Wilayah of Ahl Al-Baytasws  the most valuable treasure to be guarded, preserved and passed on to their children, generation after generation. The role of those who converted to Shia Islam is equally admirable as most of them had to leave their dear ones and had to adopt to a new way of life and religious practice. They too face an uphill task to find the real teachings of Islam, as there are so many sects and views (mostly negative) about Muslims. Islam today is a reflection of years of distortion and innovations, therefore, the Islamic practices will be very different at the time when the last Imamajfj reappears to correct our affairs; as per various Ahadith, most religious authorities will oppose himajfj as will their followers! وروي عن الباقر (ض) وإذا خرج هذا الامام المهدي فليس له عدو مبين إلا الفقهاء خاصة، هو والسيف اخوان، ولولا أن السيف بيده لافتوا الفقهاء في قتله، ولكن الله يظهره بالسيف والكرم، فيطيعون ويخافون، فيقبلون حكمه من غير إيمان بل يضمرون خلافه. Imam Mohammed Baqirasws (the 5th Imam) says: “When Al-Mahdiajfj takes a stand, heajfj will not have an open enemy other than the ‘Fuqha’ (religious authorities). Heajfj will have the Sword (for support). And had it not been for the sword in hisajfj hands, the ‘Fuqha’ would issue ‘Fatwas’ for himajfj to be killed, but Allahazwj will Support himajfj with ‘Al-Karam’ (Divine Powers) and the Sword. They (the Fuqha) will obey (himajfj) and will be fearful. Thus, they would be accepting hisajfj rulings without ‘Eman’ (belief) but they will harbour (enmity) against himajfj. 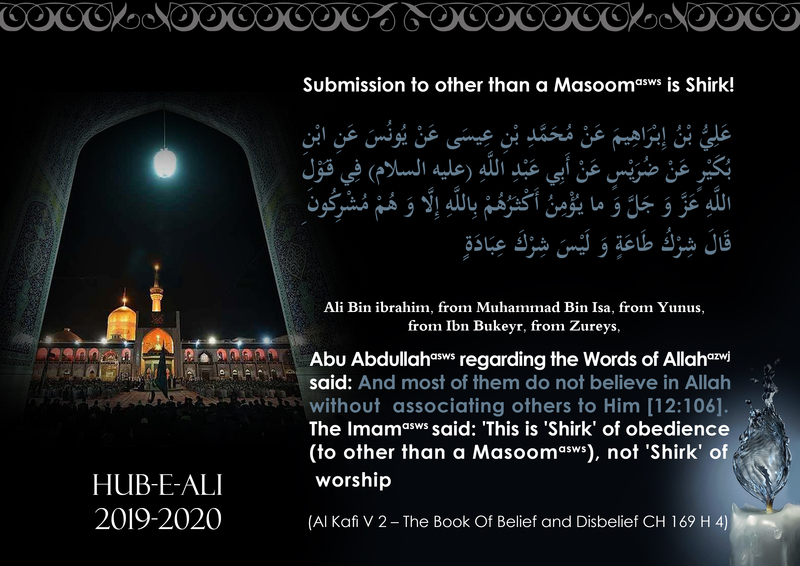 The aim of www.hubeali.com is to prepare ourselves so that we can be in the service of the 12th Imamajfj, when heajfj reappears and revives the religion of Allahazwj. To achieve the desired level, it is essential to revert back to the basic teachings of Islam, as communicated to us by Rasool Allahsaww and his 12 successorsasws – that have reached us today in the form of Ahadith (traditions). May Allahazwj enable us to believe and act with all that which Pleases Him and Forgive all our mistakes, Ameen Suma Ameen! Total submission to the Prophetsaww and hissaww pious familyasws.